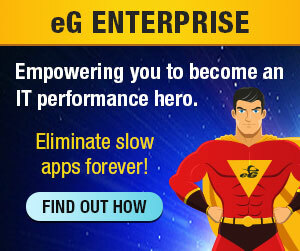 eG Innovations today announced a partnership with Login VSI, a leading vendor of load testing software for Virtual Desktop Infrastructures and Server Based Computing environments, to offer customers a more comprehensive virtual desktop service performance solution that increases user satisfaction, minimizes the risk of performance issues and reduces support and infrastructure cost. When eG Innovations VDI performance monitoring capabilities are coupled with Login VSI for VDI performance testing, users gain a complete solution for performance assurance. During the design and implementation phase, Login VSI’s performance testing helps to make better infrastructure decisions, helping to select the best infrastructure options and validating hardware estimates. When in production the combination of load testing, stress testing and change impact prediction provided by Login VSI, and performance monitoring and pre-emptive diagnosis provided by eG Innovations offer a complete solution to prevent and quickly solve performance problems during production. The companies plan to host a complimentary and free, joint webinar titled: “Assuring VDI Performance: How to Combine Testing and Monitoring to Deliver High-Performing Virtual Desktop Environments” on September 25, 2013 at 11 am ET | 8 am PT | 10 am CT | 5 pm CET.